The Documents Prefix and running number in the eStockCard Inventory Software can be set under Settings > System > Operation Setting. Click on the “Transaction” tab and then click on any of the document tab (Quotation, Sales Order, Purchase Order or etc) that you would like to change. 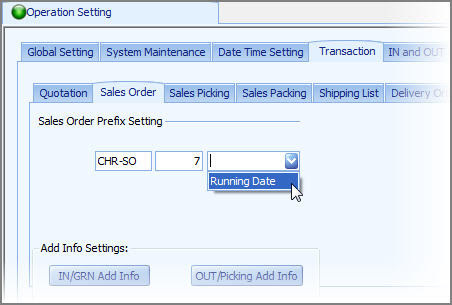 Refer to the screenshot below to see how to change the Sales Order Prefix to “CHR-SO” and start the Sales Order Number from “8″. The first field is to define the Prefix and the middle field is for the running number. In this case, key in “CHR-SO” at the first field. If you want to start the Sales Order from number 8, please key in number “7″ in the middle field. Therefore, when you generate the Sales Order, the running number system generates will be starting from “8″. For your info, the Prefix can be in alphanumeric or you can leave it blank if your number format is without Prefix, just delete the prefix and save it will do. If you want to add the running date at the back of the Sales Order number, then click on the drop down list and select the “Running Date”. If it is not required then just leave it. Lastly, click the Save button at the bottom to save the changes.